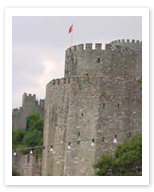 Massive, impressive and possessing a stoic beauty, this fortress situated at the narrowest point of the Bosphorus was built by Sultan Mehmet the Conqueror in 1452 as a first step in his conquest of Byzantine Constantinople. In just four months, this imposing structure, virtually unchanged in over five centuries, was constructed under the supervision of three Generals, each under pain of death if they didn’t complete it on time. Known as The Fortress of Europe, its cannons were trained on foreign ships sailing from the North. After the sinking of a Venetian vessel, the Bosphorus was blocked and the city cut off from re-supply. This was accomplished by stretching an enormous chain, the “throat cutter,” with links the size of a small car across the Bosphorus, isolating the city and making Mehmet’s conquest markedly easier. Today, during summer days, a quite different atmosphere pervades, as live concerts are held within the walls, Asia just across the water serving as a dramatic backdrop.